SAP18 is a member of the histone deacetylase complex. This complex consists of SIN3, SAP30, HDAC1, HDAC2, RbAp46, RbAp48, and other polypeptides. It can interact directly with SIN3 and, when joined to the promoter, can enhance SIN3 mediated transcription repression. Spliced varients of this gene exits and are associated in apoptotic cycles. 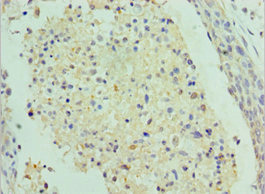 SAP18 Polyclonal Antibody. Unconjugated. Raised in: Rabbit.